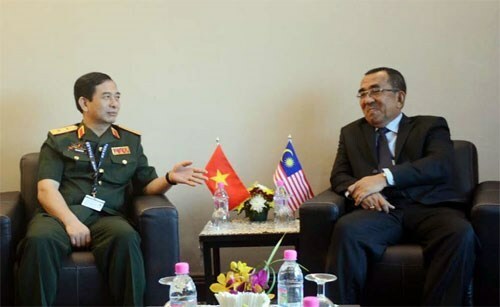 Kuala Lumpur (VNA) – Malaysian Deputy Defence Minister Mohd Johari bin Baharom told his Vietnamese counterpart Phan Van Giang at a meeting on March 22 that the two countries have great potential to cooperate in the defence industry as both of them want to modernize their armies. He welcomed the Vietnamese military delegation to the 2017 Langkawi International Maritime and Aerospace Exhibition (LIMA 2017), which is taking place in Langkawi, and expressed wish that Vietnam and Malaysia enhance their partnership in the field of defence. Deputy Defence Minister Phan Van Giang, who is also Chief of the General Staff of the Vietnam People's Army, applauded Malaysia’s organisation of the exhibition, which is one of the prestigious events of this kind in the region. The same day, Giang had a meeting with Chief of the Malaysian Defence Force Tan Sri Raja Mohamed Affandi Raja Mohamed Noor, during which the two sides reviewed the bilateral defence ties in the recent past and discussed measures to strengthen the ties in the time ahead. Also on March 22, Vietnam’s military delegation attended the Air Chiefs Conference 2017 and the Chief of Navy Roundtable Talks in the framework of LIMA 2017. The Air Chiefs Conference focused on strategic security issues in the Southeast Asian region. Delegates looked into challenges and proposed essential solutions to maintain the strategic security environment in the region. Meanwhile, the Chief of Navy Roundtable Talks dealt with issues related to maritime security and safety, terrorism and piracy, which delegates considered major issues for both the region and the world as a whole. They said cooperation and coordination are needed to address those issues. Participants appreciated the sharing of information via hotlines, joint patrols of key waters and the building of capacity for regional navies through modernization of equipment.